Bonn, 27 July 2017 – On Monday, 24 July the CMS Secretariat welcomed a new Champion under the dedicated programme which encourages continued support for the work under the CMS Family. The Government of Italy pledged €1 million in support of the development of an atlas on bird migration in the African-Eurasian region over the course of three years. The atlas responds to the needs of the Convention and its family, and is expected to be a stepping stone to the creation of a Global Animal Migration Atlas. To this end, the African-Eurasian Bird Migration Atlas will be based on bird movement data provided by the EURING (coordinating organization for European bird-ringing schemes), and will lay the foundation for the integration of further datasets. The understanding of species migrations would help identify certain drivers of population declines and mitigate them with conservation actions. Knowing species‘ critical sites and migration routes would also assist in avoiding future conflicts with large-scale land use changes and developments, such as extractions, energy infrastructures and deployment of renewable energy technologies. The donor agreement was signed today in Rome, Italy, at the premises of the Italian Ministry of the Environment, Land and Sea. This generous contribution will be officially celebrated during the Champion Night in the margins of the Twelfth Conference of the Parties to CMS, on 22 October in Manila, the Philippines, where the Government of Italy will be recognized as Champion Plus and will be presented with a certificate. The Migratory Species Champion Programme has a dedicated page on the CMS Family common portal, accessible here. More information can be obtained from Laura Cerasi at the CMS Secretariat. 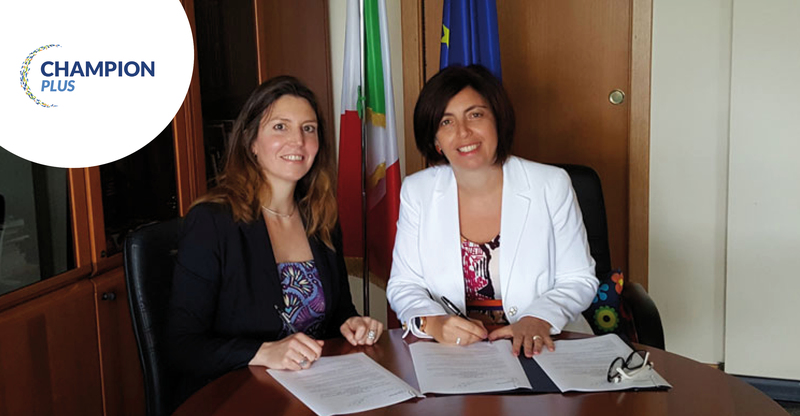 Pictured are Ms. Maria Carmela Giarratano, Director General for Nature and Sea Protection, Italian Ministry of the Environment, Land and Sea and Ms. Laura Cerasi, CMS Fundraising & Partnerships Programme Officer.